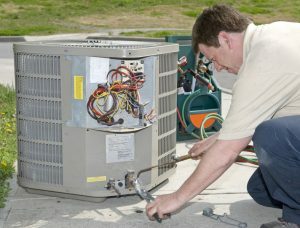 What Are the Steps Technicians Take During HVAC Maintenance? In our previous post, we spoke a little about how important HVAC maintenance is. And with the official start of fall just a few short days away, the time to schedule heating maintenance is definitely now, if you haven’t already had this service done for the season. Or maybe you are proactive, and have maintenance done like clockwork, in the fall for your heating system and in the spring for your air conditioner. This routine preventive maintenance keeps your HVAC system running well and can even extend the lifespan of the system. But what actually happens during maintenance. What are our technicians actually doing? What are they looking for? There are a number of things that your HVAC technician will do during maintenance that will ensure your system is functioning properly, and continues to do so for the months and years to come. Checks Electrical Components: You may not even notice an electrical problem or malfunction with your HVAC system, but one of our highly trained technicians certainly knows how to spot them! During your maintenance appointment, your HVAC technician will check for loose wiring connections and frayed wires throughout the system. If there is a problem, your HVAC system can’t perform as well as it should and may even be posting a safety hazard for you and your family. Checks Your Thermostat: Your HVAC system’s thermostat is essentially the brain of the system, and the part you interact with the most. A trained technician ensures it remains up to par by calibrating it and making sure its functionality is still intact. Checks Refrigerant: Did you know that your HVAC systems are supplied with enough refrigerant upon installation to ideally last their entire lifespan. That’s right, it does not dissipate like it does in a car. This means, if your system is losing refrigerant, it means you have a leak that must be located and accurately repaired. Clears Condensate Drain: When your cooling system drains, the condensate drain is the component that removes condensation. If everything functions as it should, then water collects in a pan and drains away. During high usage times like summer, the drain can overflow and cause water damage to other parts of your system, and your home. Your AC capacitors work with the blower, the motor, and the compressor. If these capacitors don’t work accurately, your system will struggle. Fortunately, during your maintenance appointment, we can help with that, at least by reducing the risk. The above mentioned factors are just a few that service professionals look at, but there are more. For instance, you may have dirty coils that need cleaning, a blower fan that is struggling to give you enough airflow, or even hot spots in your home. To learn more about our Camden County, NJ maintenance agreement and to schedule your next HVAC tune-up session, contact Ambient Comfort today. Trust us to keep you comfortable!